Treatments and Prices at the El Oceano Beauty Salon between Marbella and La Cala de Mijas. 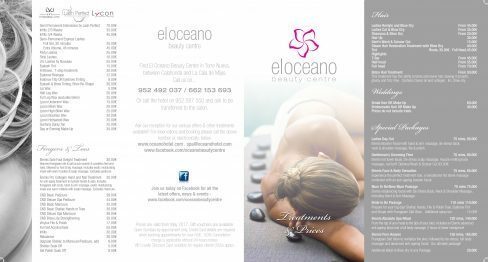 An extensive range of top quality beauty treatments all carried out by the most professional and well trained team, in the wonderful surroundings of El Oceano. 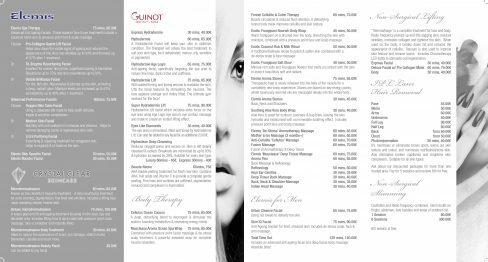 Choose from a range of effective, luxury treatments. We use only the best products from Elemis, Guinot, Shellac and Crystal Clear, to name a few. Our stylists, technicians and therapists are fully trained, professional and friendly. Steam Hair Restoration Treatment with Blow Dry. This treatment has the ability to tame and revive hair, leaving it smooth, glossy and frizz-free. Contains Caviar oil and collagen. Inc. blow-dry. These superior face & eye treatments include a luxurious hand, arm & pressure-point foot & scalp massage. Helps slow down the visible signs of ageing and reduces the appearance of fine lines and wrinkles up to 94% and firmness up to 57% after 1 treatment. Excellent for uneven skin tones, superficial scaring & blemishes. Resurfaces up to 75% and skin smoothness up to 32%. For dry, dull skin. Rejuvenates & plumps up the skin, achieving a dewy, radiant glow. Moisture levels are increased up to 61% and elasticity up to 40% after 1 treatment. Using a Japanese silk mask to help sooth delicate, fragile & sensitive complexions. Bursting with anti-oxidant rich minerals and vitamins. Helps to remove damaging toxins & regenerates skin cells. A purifying & repairing treatment for congested skin, helps to regulate & re-balance the skin. A deep, detoxifying blend to de-congest & stimulate the system, boosting metabolism & increasing energy levels. Combined with pressure point facial massage & de-stress scalp treatment. A powerful seaweed wrap for complete muscle relaxation. Boosts circulation & reduces fluid retention. A detoxifying fennel body mask improves cellulite and skin texture. Warm frangipani oil is drizzled over the body, drenching the skin with moisture, combined with a pressure point face and scalp massage. A traditional Balinese recipe to polish & soften skin combined with a de-stress scalp & face massage. Minreal-rich salts and Frangipani flowers that melts on contact with the skin to leave it beautifully soft and radiant. Therapeutic heat is slowly released into the belly of the muscle for a completely new body experience. Stones are placed on key energy points, whilst luxuriously warmed oils are massaged deeply into the whole body. Aloe Vera is great for sunburn, psoriasis & bug bites, leaving the skin hydrated and moisturised with an immediate soothing effect. Includes pressure point face and scalp massage. Fusion of Aromatherapy & Deep Tissue. Known as the celebrity's favourite treatment. A skin resurfacing treatment for acne scarring, pigmentation, fine lines and wrinkles. Includes a lifting face mask revealing clearer, fresher skin. A luxury peel and lift anti ageing treatment focusing on the eyes, lips and décolleté area. Includes lifting face & neck mask with pressure point scalp massage. Skin is smoother and instantly lifted. Helps to reduce the appearance of scars, sun damage, stretch marks, blemishes, cellulite and much more. Elemis Booster Facial with hand & arm massage, de-stress back, neck & shoulder massage, file & polish. Elemis hot towel facial, De-stress scalp massage Muscle melting back massage, nail buff. Optional gents wash & scissor cut. Experience the perfect treatment duo, a sensational hot stone massage combined with an anti-ageing booster facial. Elemis rebalancing facial with De-Stress Back, Neck & Shoulder Massage, including Hand & Arm Massage. Prepare for your big day! Shellac Hands, File & Polish Toes, Eyebrow Tint and Shape with Frangipani Salt Glow. Optional spray tan. From the top of your head to the tips of your toes, includes an Elemis advanced anti ageing facial and a full body massage. 2 hours of sheer indulgence! Frangipani Salt Glow to revitalize the skin, followed by de-stress, full body massage and advanced anti-ageing facial. Our ultimate package! May be added to all above special packages. A Hydradermie Facial will keep your skin in optimum condition. The therapist will advise the best treatment to suit your skin type, be it dehydrated, mature, oily, sensitive or pigmented. With added firming and toning serum to revitalize the skin. This treatment focuses on the face, eyes, neck & décolleté. Hydradermie Lift facial which includes extra focus on the eye area using Age Logic eye serum, eye contour massage and mask to create an instant lifting effect. Anti-ageing facial, specifically tagretting the eye area to reduce fine lines, dark circles and puffiness. The eye area is stimulated, lifted and toned by Hydradermie Lift. Can also be added to any facial for an additional 20.00€. Reduces clogged pores and excess oil. Skin is left deeply cleansed & radiant. Breakouts are minimized by up to 93% & hydration increased by 39%. Suitable for every skin type. AHA double peeling treatment for fresh new skin. Contains AHA, fruit acids and Vitamin C to provide a complete gentle peeling. Fine lines and wrinkles are softened, pigmentation reduced and complexion is illuminated. Using hot towels to detoxify the skin. Anti-Ageing booster for tired, stressed skin. Includes de-stress scalp, face & arm massage. Includes an advanced anti ageing facial and deep tissue body massage. Absolute bliss! ‘ThermaVisage’ is a complete treatment for face and body. Radio frequency plumps up and lifts sagging skin, reduces wrinkles, increases collagen and tightens the skin. When used on the body, it breaks down fat and reduces the appearance of cellulite. Vacuum is also used to improve skin texture and remove toxins. Includes Chromotherapy LED lights to stimulate cell regeneration. IPL minimises or eliminates brown spots, evens out skin texture and colour, and minimises red/flushed/acne skin. Also eliminates broken capillaries and brightens skin complexion. Suitable for all skin types. Ask about our discounted packages for more than one treated area. Pay for 5 sessions and receive 6th for free. Cavitation and Radio frequency combined. Best results on thighs, abdomen, love handles and areas of stubborn fat. Browse our treatments and decide what looks best for you! Then make an appointment and talk to our professional and well-trained team about your perfect beauty regime! Find El Oceano right on the water-front between Marbella and La Cala de Mijas, on Spain’s beautiful Costa del Sol. Getting here is easy, we are just a 5 minutes from La Cala and 15 from Marbella.